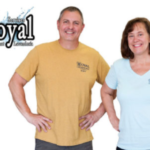 In one stop at Royal Laundromat, you can drop off you laundry ( along with the stress of getting it done ) with us and let us wash, dry fluff and fold your laundry. You can go to work, or to lunch, or do whatever you would rather be doing as we take care of your laundry tasks. You can accomplish this in one stop. We have same day drop off service and next day drop off service at both our locations; 96th Street and Allisonville Rd in Indianapolis and 6621 W Broadway St in McCordsville. You will be able to pick up your clean laundry knowing that you can go home and NOT HAVE TO DO YOUR LAUNDRY!! !